After weeks of waiting, we have finally arrived. Week 1 of the NFL season is upon us, which means this show has plenty to talk about as you head into the fantasy season. 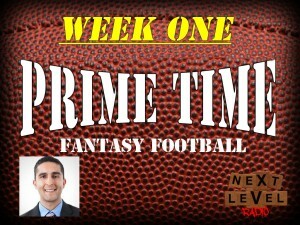 During episode eleven of Prime Time Fantasy Football, Adam Gori, Joe Webster and I all talk about everything that is fantasy-relevant heading into Week 1. We kick off our first show without any division or positional previews with a recap of our Prime Time Fantasy Football draft, which happened September 2. While Adam and I are in the league, Joe is not so he ran that segment and told us which picks and teams he liked or didn’t like the most. We followed that with a new game we like to call “High/Low,” where essentially we choose a few players we like this week and a few we don’t like because of their match-up. Where do guys like Matt Forte, Eddie Lacy and Colin Kaepernick fall? Listen here to find out. We follow that with an awesome interview with Eagles beat writer Sheil Kapadia of Birds 24/7. Sheil not only gives us the outlook of an offense whose players many of us have in fantasy, but he also previews Week 1 and how he thinks Philadelphia and Jacksonville fantasy-relevant players will fare. We also play a little “Over/Under,” but this time with a twist. We’ll look at Week 1 projections and decide if we think a player will go over or under their point projection or positional ranking for the week. Joe also had a fantasy draft starting at this point, so we helped him with a few picks which was fun. Even though he picked the wrong guy in round 2. We also wrap up with what we hope will be a mainstay of our show. Listen on to find out what that is! Click To Tweet –> Check out the Week 1 preview from @NXTLevelRadio, with hosts @AdamNextLevel, @joeyweb32 and @srichards31!